Excel's INDEX function allows you to look up a cell contained in a column or table of data in an Excel worksheet, and return the value found in that cell. There are several scenarios where the INDEX function can come in handy when working with Excel. Here are some examples. You have a list of values in a column or row, and you want to find out the third value in the list. You have a table of data (multiple rows and columns). You want to find the value in the cell located at the junction of the third row and the fifth column in the table. It's important to note that INDEX can seem somewhat limited when used on its own. For that reason, it is best used in conjunction with other functions such as MATCH or DAY in order to take full advantage of its power. The INDEX function has the following syntax. Note that there are two different versions of the INDEX function, the Array form and the Reference form. We'll be focusing on the Array form in this lesson, but I've included the Reference syntax as well, for completeness. =INDEX(array,row_num,[column_num]) - this is the array form of the INDEX function. =INDEX(reference, row_num,[column_num],[area_num]) - this is the reference form of the INDEX function. Note that the use of  around an argument means that it is optional when you are writing a formula using the INDEX function. array refers to the range of cells you want INDEX to look in, such as A1:A10 or A1:C10. column_num refers to which column you want INDEX to look in. It's optional and you only need it if you want to look in a column other than the first column in the array you specified. row_num refers to which row you want INDEX to look in, as we saw for the Array form of INDEX. column_num refers to which column you want INDEX to look in. It also works the same as in the Array form. area_num refers to which reference range you want to look at. If you set reference to (A1:B10,G1:G10), you would set area_num to 2 in order to tell INDEX to look in the second range. Note that if you only define one range of cells in reference then the Reference form will work exactly the same way as the Array form. Now let's look at a simple example of the INDEX function in action. As noted above, we are going to concentrate on the Array form of the INDEX function in this lesson. Imagine you have a spreadsheet that show sales by the day for the last four weeks, and you want to find the sales for Wednesday in the first week. Remember - this is a simple example to illustrate how INDEX works. Your real world examples are likely to be complex than this. Note that Wednesday is in the third row of the table (I'm going to ignore the heading row in this example). It's important to note that each of these formulas gives the same result. In the first version, Excel assumed column 1. In the second version, we explicitly stated it should look in column 1. The third version is the same as the first, except we provided a bigger range of cells to look in. That doesn't matter - Excel will still look in the first column unless we specify otherwise. Note that Sunday is in the seventh row of the table and Week 3 is in the third column. We will write the formula in the following way, remembering that we must now specify which column we want to look in. Excel's INDEX function is a powerful function when you want to find a value in a specific row and column location inside a table of data. Our examples used numeric values to identify the row and column values that INDEX should work with. However, you can use other formulas inside the INDEX function, or references to other cells in your worksheet, in order to make INDEX more useful and effective in your Excel spreadsheets. Do you have a specific example in which you want to use the INDEX function? Why not post a comment describing your scenario, and we'll see if we can add it to our list of examples in this lesson. I'm not sure what function to use in this situation or if it even do-able. I am using Excel to prepare letters that go to landowners whose crops were affected by recent construction. I am using a template for a mail merge to print letters to the landowners that is working beautifully. However, I want to be able to pull the information about that landowner's crops from another worksheet onto the letter. If it was a one-to-one reference, it wouldn't be a difficult task. There are many more columns in my table that have the formulas used for calculating the offer based on type of crop, county, length, yield, etc. My question is how can I pull the rows of information for each landowner's crops from the "Crop" worksheet onto the "Form" worksheet? When I print the letter for John Smith his three parcels of land will appear on his letter and Amy Nelson's parcel will appear on her letter, etc. I was inspired by your question to write a whole new lesson on how to use the INDEX function to return all the values from a list that match the look up value. You'll need to expand on it a little to meet your requirements. Specifically, you'll need to add columns to your Form spreadsheet for every value that you want to include from your Crop worksheet. So if a land owner could have up to 5 parcels, and you want to include 7 values for each parcel in the mail merge letter, you'll need 35 columns with a version of this formula. Is this part of the text correct? •Note that Friday is in the seventh row of the table and Week 3 is in the third column. •We will write the formula in the following way, remembering that we must now specify which column we want to look in. I cannot understand why you have stated that Friday is the seventh row of the table unless, I've completely misread something here or you mean Sunday? Is this correct or can you explain? Thanks for spotting the error! Thanks for spotting that. It should have referred to Sunday in the 7th row. I've updated the lesson to fix that mistake. I have a long list of account names, and sometimes they show up multiple times (as we have multiple action items associated with each account), and I want to return a value from some of the Columns associated with the accounts. In my Summary, I'm trying to do something like a Vlookup, to compare against all our account names, but Return the values as Yes/No of the action items done over a 3 month period. Lookup the account value and return... Yes/No- was a call completed? Yes/No- was there an attempt? Yes/No- was there a follow-up? Any suggestions on this problem? Please let me know if more details need to be provided! Thank you for your help!! I think that a Pivot Table would be better for what you're trying to do (which is quickly summarise a large number of rows of data). When you create the Pivot Table, drag and drop the Scheduled, Followup and Call Attempt items into the Values section of the Pivot Table builder. Since you have text values in these columns, Excel will default to counting them, yielding the results above. This solution assumes that your spreadsheet only has values in the Call Completed, Followup Call and Call Attempt columns where there was some activity, i.e. the other cells really are blank. If they aren't, this solution won't work since Excel will count all of the cells that contain a non-blank value. Hopefully this gives you a pointer in the right direction. Let me know if it doesn't solve your problem. 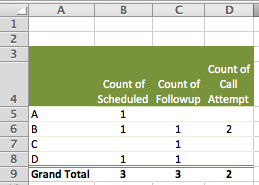 Would I still be able to do another Pivot Table off the Pivot Table example above? How is your data set out? Is the won/lost information in the same table as the data for your initial Pivot Table, or in another table? I have a table with about 10x10 which has data numbers in it C3:L13, labelled 1 to 10 on x axis and different number headings on the y axis. Based on numbers calculated in another sheet, i want to write a formula for calling a particular cell within the table. Im a little lost how to go about it. IE say if my value needed to be in the D column and row 13 based on the calcs, how would I write the formula? Similarly if I changed my calcs to E and 6 i dont want to have to manually search for it. In the file attached, I want to search both sets (Set1 & Set2) of numbers, fine and display all the same numbers in the Similar Numbers column. In the file Team Lead Summary 2014 Automation Test.xlsx, I have a worksheet called Rep Performance Comparison and a table called WeeklyComparison with 8 columns and 10 rows (my table range is in cells A7:H16). In the file Test-AutoImport.xlsx, I have a worksheet called Weekly Summary and a table called WeeklyStats with 8 columns and an undetermined number of rows (new data is appended to the table weekly). The table range to start is A16:H17. I also have the username stored in cell B3. I am trying to Search column 1 (cells A7:A16) in the WeeklyComparison table for a value stored in cell B3 of the Test-AutoImport.xlsx file, and copy the data in columns 2-8 (B7:H7) to columns B17:H17 of the WeeklyStats table. I enter the formula as an array formula (CTRL+SHIFT+ENTER) and get a #N/A error. P.S. I can only attach one file, so I have included both of the referenced worksheets in my sample file. I've also included my formula as a comment in cell B17 on the Weekly Summary worksheet. and i want the value of last rate of name similar to the name 2 in the coloumn D that is rates. Is there any formula for such. Is this function for me? Trying to solve problem with spreadie at work. Have column of alpha-numerical data (e.g. S1002) codes divided by text "shift end". Is it possible to sort it all in two additional separate columns? Column one all data abowe "shift end", column two, all data below "shift end"? I have a spreadsheet with dates in horizontal cells and peoples names in vertical cells. At the intersection of the date/name array is further data. Can lookup or other functions be used for finding the data using only date and name inputs and not row numbers? Hi, I am not very familiar creating formulas or the use of Index Match. I work in Clinical Research and we note by country, the number of the the CRA would have spent on site. So, In my table I have put in columns to count the number of Days someone spent at a medical site. This can be anywhere from 1 to 4 days. I then must break this information further out by country and days at the bottom of the sheet. Would it be possible to use Index Match or create a formula that would look at Ukraine, for example, and give me the number of days spent on site ranging from 1 day to 4 days, then give me a '0'. The information is included in the upper part of the table. Please forgive me if my question takes you in a circle and trust it is comprehensive. suppose I have multiple records for same ID in sheet one. In sheet two, there are few selected unique Id's from the sheet one. Now, in sheet three I want all the records from the sheet one for the selected unique ID's in sheet two. Like for eg. consider Id: 88455 from template sheet. Now I want all the records for this ID from sheet one i.e. Audit sheet in sheet three. I want to find the SOV Item that goes with the Bill Code. There is tab with the entire list of SOV Items. I get this list of Bill code and just manually search for the Bill Code number in the SOV Items tab then paste that next to the Bill Code. And do that for 60+ lines.I tried vlookup but it came back with incorrect amounts when I tried to check it. Should I do INDEX or MATCH instead? I have a spreadsheet which collates a number of customer responses to an issue. The repsonses are all held in separate tabs depending on what the subject of the question was. I have collated this into one sheet so that i can see the full range of response from each person based on their unqiue reference. However, as they are not obliged to answer all questions, I have had to put data from all tabs into the one sheet. This means that I have multiple records of the person's details, the date of the response etc. What I am looking for is a formula which looks at various cells, some of which are blank and some of which have a value (which will be the same value for all populated cells) and give me that value back. I have already tried a nested IF statement but there are 10 columns of data so it didn't seem to like that. My company gave me a project to make a cable sizing spreadsheet in two months. Now i have gotten to a cross road where i need professional assistance. I am dealing with about 16 tables. and my spreadsheet is designed to make intelligent decisions when the user inputs some random values. From the table i uploaded, my calculation returns 43.5 amps. i need excel to return/suggest an equal or approximate (must be greater) amp available in the tabulated reading. also, i need excel to return the left-most cable size column corresponding to the approximated tabulated amp(returned by excel), and if possible, the column header of the column where the approximated value is found. Pls, find attached excel sheet titled cable sizing. That should explain my intentions clearly. Kindly give me a detailed solution to this problem. i have exhausted all options i could lay my hands on. I have a prospect master. To call a prospect, I pull the prospect name from the master into the calling record sheet ("Pipeline"), and use VLOOKUP to pull the corresponding phone number and location also from the same record in the master into the calling record sheet. When I use VLOOKUP, it picks the first occurrence of Anil Kumar in the prospect master and populates the phone number and location from the first occurrence. So instead of Anil Kumar 23415016 New Delhi and Anil Kumar 9321376938 Mumbai, I get both as Anil Kumar 23415016 New Delhi. I am creating a table with equipment down Column one and tools across the top of row one. I need to have my formula first look for the Tractor/equipment used and then the tool/machinery pulled behind that particular implement and come up with the cost per acre in the intersecting cell on the table. After the cost per acre is found I need the formula to multiply it by the number of acres in a cell for that particular field (separate table). I would also like to look up the owner and return a value of zero so they are not being billed for their own equipment. OWNER Name Name Name Etc. if statements, i.e. if cell "X" = Quad Track and Cell "Z" = Wishek Disk, then look up " " on table 2. I don't know if this is even making sense, I hope so! Hi there! I am having trouble figuring out how to extract the information I need in this spreadsheet. Basically, I have a list of qualities (Leadership, Teaching, Knowledge, etc.) and people with those qualities. The spreadsheet has each quality and the people with those qualities, but I need a list of each individual and all their qualities. Is this possible? Never mind. I figured it out! Wendy, do tell! What was the solution?